You don’t need to be in Barcelona too long to notice it, perhaps in the lobby of an uptown apartment building or even in a dentist or doctor’s waiting room. 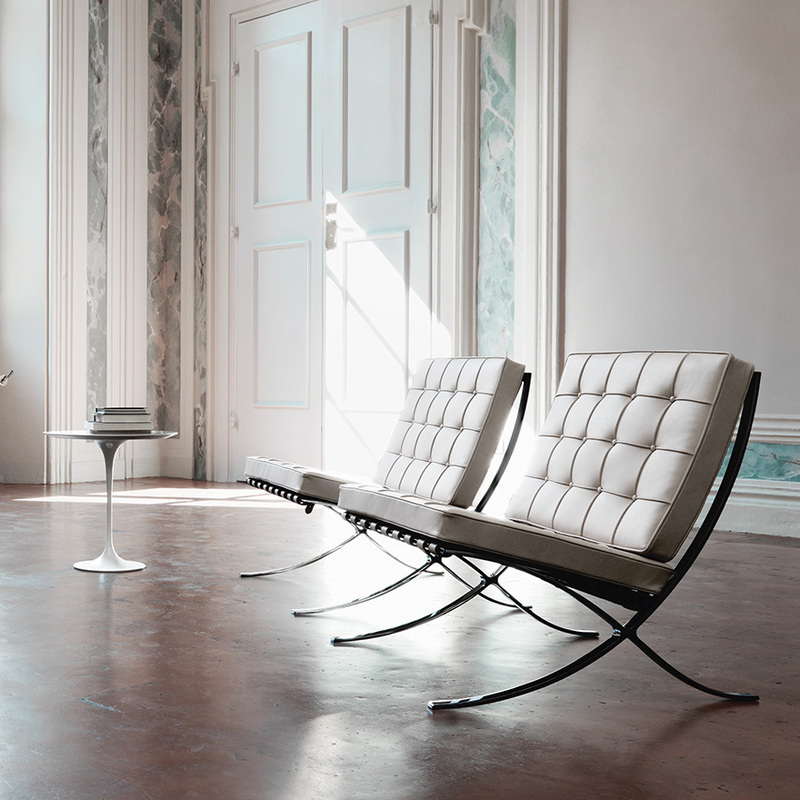 The ‘Barcelona’ Chair was designed by Mies van der Rohe as a bespoke piece for the German Pavilion – the iconic building that is generally regarded as the birth of the modernist movement. The chair and the pavilion, which stands on its original spot just north of Plaça Espanya, were created in tandem. As most people know, the German Pavilion, which launched the architect’s career internationally, was designed by Mies for the 1929 world’s fair. With its perfectly formed planes, scant spectrum of materials (it’s created in glass, chrome and marble, no more, no less) and indoor-outdoor flow of space, one can imagine the scandal it caused against the faux baroque and classical palaces that surrounded it at the time of the event. Royalty was expected to attend, and the Barcelona Chair was conceived to accommodate regal behinds. With its thick, buttoned leather upholstery and wide girth, the Barcelona Chair is commanding and formal. Telling, the architect based the design on a Roman Curule Chair, though this basic frame, which consists of intersecting, curved bars is also seen in classical chairs of the 19th century. This consideration towards the ruling classes seems odd for an architect whose ethos was rooted in the Bauhaus. However according to the website of MoMa, which has the Barcelona Chair in its collection; It had to be an "important chair, a very elegant chair," according to the architect. "The government was to receive a king. . . . The chair had to be . . . monumental. In those circumstances, you just couldn't use a kitchen chair." The Barcelona Chair never received the royal bodyweight it was made for, and the pavilion itself was torn down at the end of the fair (later to be rebuilt in the late 1980s). However in 1953, Mies granted the rights of the chair to Florence Knoll, friend, designer and partner in the Knoll furniture company – arbiters of mid-century moderne design and décor. As recently as 2011, ownership of the Barcelona Chair has been in dispute as other manufacturers continue produce the chair – albeit under a different marketing names. 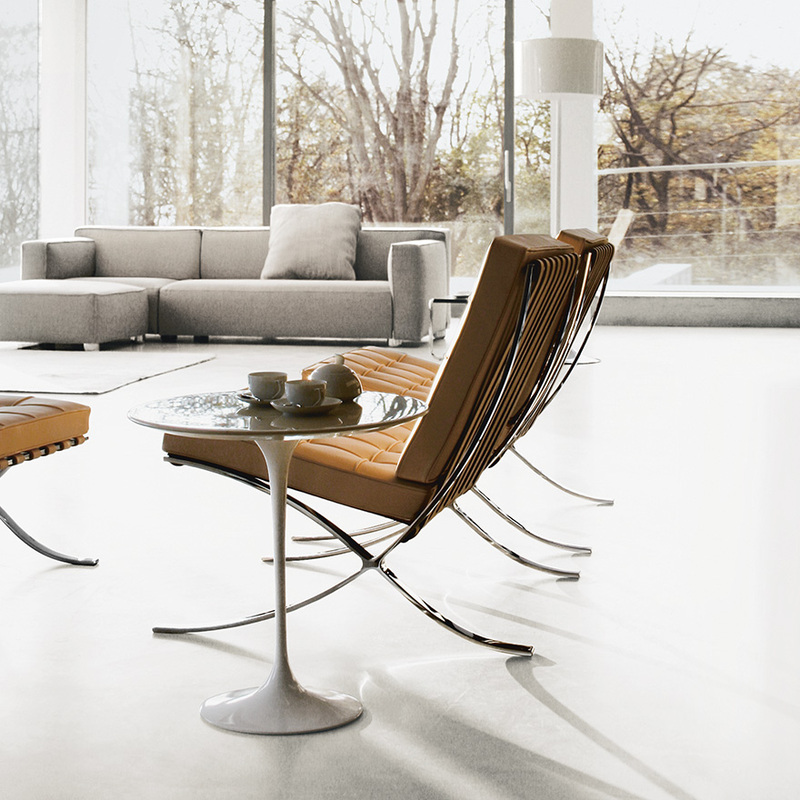 Knoll has spent considerable time and money defending the trademark of one of their signature pieces. In their catalogue, the Barcelona Chair retails at just under US$5,600 and is available in brown, various shades of grey and black. (Curiously, the chair’s original white kid leather is not offered). But quick web search reveals it for under 300 euros, albeit in imitation leather and sans the engraved signature of the architect that Knoll’s version has. Perhaps that’s why it’s a familiar sight in Barcelona – and become the city’s most ubiquitous design icon.